David Boltz is a native of Lebanon County, Pennsylvania, where he began playing trumpet at the young age of seven. He graduated from Lebanon Valley College in 1972 with a B.S. in Music Education. In 1975 he received a Master's Degree in applied Music from the Catholic University of America in Washington, D.C. Mr. Boltz has studied trumpet with Fred Erdman, James Thurmond, Lloyd Geisler, and Donald Reinhardt. He also studied conducting with James Thurmond, Thomas Lanese, and Lloyd Geisler. During 1972-'73 Mr. Boltz was an instrumental music teacher in the Greencastle-Antrim School District, Greencastle, Pa. His duties encompassed elementary and high school band teaching. 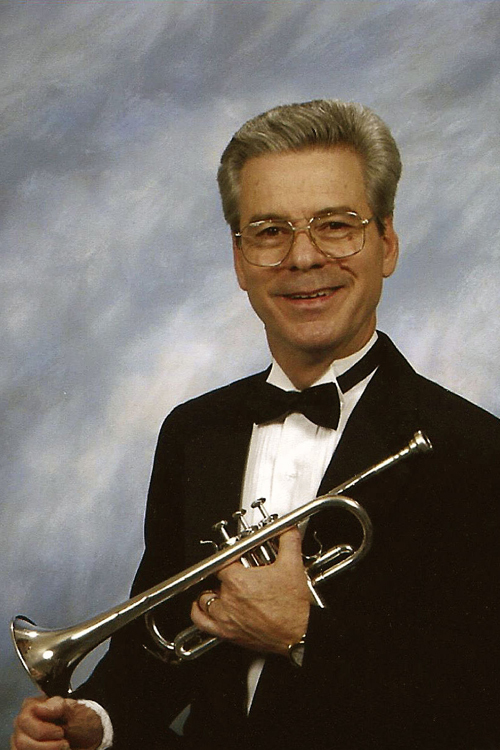 From 1973 through 1993 Mr. Boltz served as a trumpeter/cornetist with the U.S. Air Force Band in Washington, D.C., where he was a member of the Concert Band and Symphony Orchestra. During his tenure with the Air Force, Mr. Boltz was a featured soloist on several occasions, performed with the Camerata Brass Quintet, and was a member of the Concert Band's Dixieland Band. From 1993-2011 Mr. Boltz was an instrumental music teacher in the Fairfax County Public School system of Virginia. From 1993-2002 he was an elementary band director. He was the band director at Longfellow Middle School in McLean from 2002-2005. In 2005 Mr. Boltz returned to teaching elementary band and retired from Fairfax County Schools in 2011. Mr. Boltz has worked as a brass instructor at several high schools and middle schools and has been on the faculty of two summer band camps. He is also in demand as an adjudicator for district band auditions and solo festivals. As a private teacher, he has over 250 private brass students to his credit. Mr. Boltz currently resides in Lake Frederick, Virginia with his wife, Suzanne. His daughter, Andrea, resides in Alexandria, and his son, Lewis, lives in Helena, Alabama. Mr. Boltz maintains an active schedule as a private teacher and professional trumpeter/cornetist, and is a cornetist with the Virginia Grand Military Band.